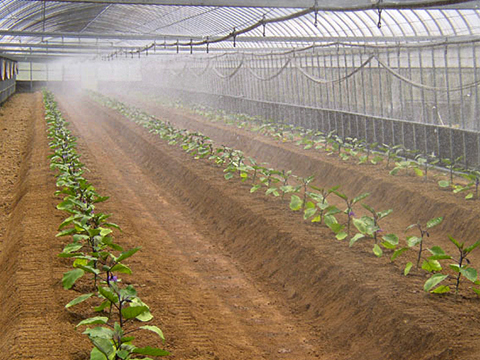 For humidifying or cooling in greenhouse. Mild rain-like mist water covers broad area (2m width). Install the tubes at the upside of greenhouse. Place TUBE-HANGER for MISTACE 20 series within 1 meter apart, and simply slide in the tube. The fine water holes are on the tube side printed with the product name "MISTACE 20 HOUSE COOL", be sure during the tube installation that this side faces up. Start connector named "START CONNECTOR MA20" can be connected to a 20mm dia. PVC pipe. Set the water pressure at 2.0 bar for making fine mist spray. The excessive water pressure may damage the tube.